UCSC sponsors outstanding educational programs—both graduate and undergraduate—in the areas of astronomy and astrophysics. Graduate Programs: UCSC is an international leader in astrophysics graduate training. We currently enroll about 40 graduate students working towards the Ph.D. degree. Graduate students benefit from the low student-faculty ratio and extensive research opportunities, as well as course offerings that cover both theoretical and observational aspects of astronomy. UCSC alumni hold positions at leading universities and research institutes throughout the world. See links in the left column for specific information about educational programs and related resources. 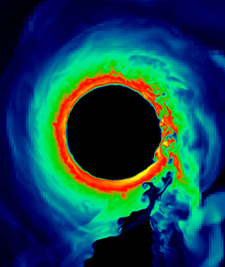 A of simulation of the accretion of a white dwarf onto a double white dwarf system. Created by graduate student James Guillochon.